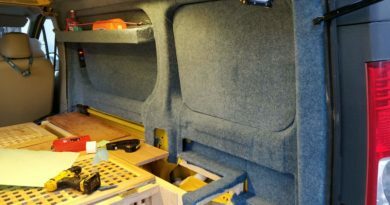 Before the internal lining and stuff could be done in Mabel, the internal camper electrics was the next thing to be sorted out. Once the interior was carpeted running new cables would be a no-no so this was probably the part of the process that required the most thought. There was a vast wad of ex-aa wiring that had been chopped and left in place but after trying to figure out where it all used to go ti I decided to start from scratch. Ex-AA rear facing floodlight reinstated. USB charging points in the back, permanently on. The plan didn’t involve any great use of power while we were out and about. Apart from lighting, charging the phones and very occasionally boiling the kettle there wasn’t going to be much in the way of current drain at all. The final decision on the leisure battery size came down to physical size. There’s a nice empty space under the passenger seat, so whatever we ended up with had to fit under there. In the end the solution worked out pretty bloody well. 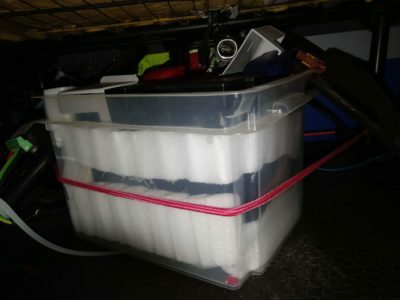 a 50AH battery was identified (based on dimensions) and it just happened to fit into a plastic box which was lined with foam padding to give the battery some cushioning. The box was then ratchet strapped into place round the frame of the seat base and isn’t bloody going anywhere. A split charging relay was then installed using some of the existing AA 30A wiring that they’d left. This had been chopped in the battery bay but I repaired this with two heavy duty crimps bolted together. the joint was then sealed with heatshrink. There was already a 30A fuse in this line (thanks AA) so basically the relay is connected to the positive terminal of the main battery. It’s a voltage sensing one so no connection to the ignition is needed. 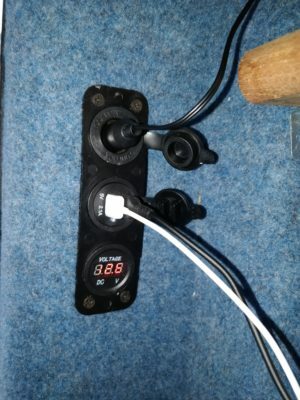 When the engine is running the voltage goes over 13v and the charging of the leisure battery starts. The leisure battery ground goes to one of the torq bolts that used to hold the bulkhead in. The leisure battery positive goes to a small (5-blade) fuse box, again courtesy of eBay. One feed then goes to the sockets at the back of the van and one goes to the sockets at the front. I did cheat a bit (remember what I said about running enough cables). The feed to the back of the van also goes to the light switch, more on that later. I’m sure we’re falling foul of some leisure battery based regulations, but so far there haven’t been any issues. The current interior lighting arrangement is pretty good, and a testament to how cheap Chinese LEDs have become. I bought a string of lights (eBay, again) and although they’re not the most elegant of things they work. 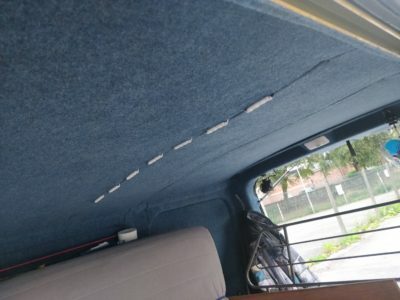 The light switch is wired so in position 1 one light comes on (at the side of the van beside the door), and in position 2 the row across the roof come on, providing an overabundance of illumination. The light switch also has another position that turns on the flood light facing out the back of the tailgate. This was an AA halogen unit that I’ve replaced with an equally bright but much lower current LED unit. Luckily this fitted onto the same mount. This third position needs the switch to be pulled out before it’ll turn. 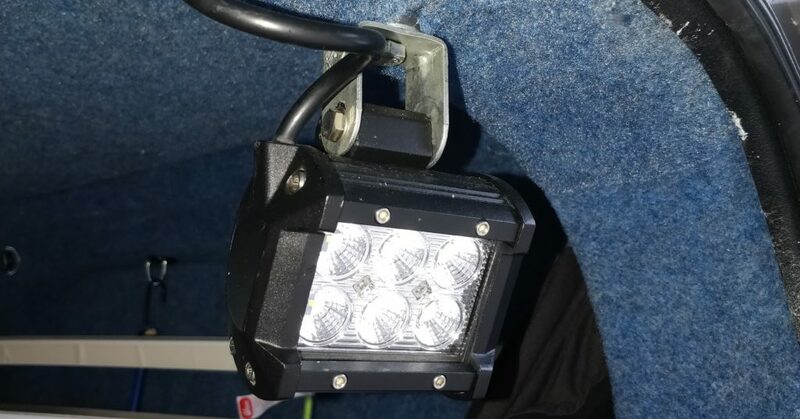 This should help avoid accidentally blinding anyone behind the van. The floodlight is a bit bright. The light switch is, frankly, a work of genius. Wandering round Sports Car Breakers scrappy near Edinburgh looking for inspiration my attention fell on an Ford Fusion light switch. Basically a rotary switch with two positions o the right of “off” and one to the left. This was ONLY BLOODY PERFECT. With the internal lights (let’s call them dipped and main beam) and the rear flood (let’s call it fog light) all on and off as I’d planned. The biggest issue, actually, was finding the wiring of the Ford light switch. You’d think that was easy enough but no, and in the end it was an hour with a multi-meter to figure out what went where. The coolest thing about this, even if I do say so myself, is the fitting location. I didn’t want switches that could accidentally be knocked on or off in the cramped confines of the back of the van. 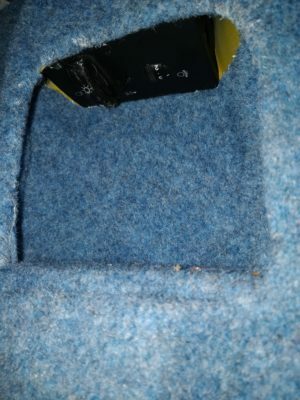 More by luck than judgement the switch fitted in the space where the rear seatbelts go in the crew cab version. And it just sort of jammed in, no clever fitting required. Two little power socket things were bought (eBay again). These had three 12v socket sized cutouts on them. One was a twin USB charger, the second was a normal 12v socket and the third was a pretty but fairly irrelevant volt meter. Well irrelevant apart from confirming the split charging was working. One of these was installed in an existing hole in the rear pillar. The other in an equally existing hole in the “window” frame on the drivers side. Again more by luck than judgement they fitted perfectly and look pretty good in situ. As mentioned before, these come straight off (via a 5A fuse) the leisure battery so all the power and stuff can be used with the ignition off. 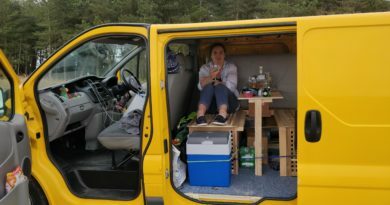 The camper electrics setup in the back didn’t take a lot of time to do, or cost that much. We’re not sure exactly how long the leisure battery will last. It’s never gone flat yet. As we’re not usually in the same place for long it’s getting charged up as we go. Right, that’s the leccy in the back done. Next up… the ICE.